Learning a bit more on using the various brush shapes in photoshop so i thought i’d write a few handy tips for all you budding artists out there who are using photoshop. 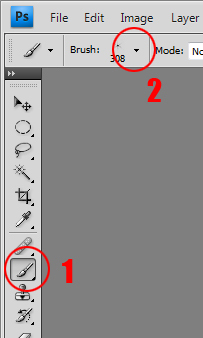 You can get to the brushes palette in 2 ways, 1st way is the basic palette and its what i always use when working on a piece of artwork by clicking on the brush tool in the side menu (see 1) and then the little down arrow in the top left (see 2). It will bring up a number of different shapes to use, but to get a better idea of what the brush stroke will look like when you start painting you can click on (3) and then click on stroke thumbnail which will bring up this palette, and these are what i use when choosing different brush shapes during colouring, when doing a simple outline i just go for a simple round brush and alter the diameter or the hardness. 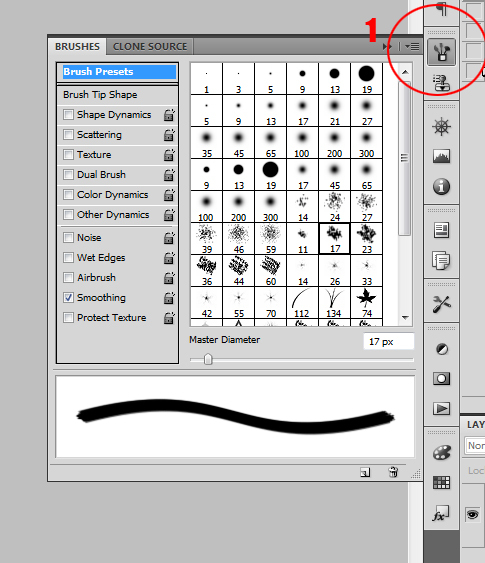 There is a 2nd palette which is more advanced by clicking on this brushes icon (1) next to all the floating palates on the right. This brings up this and in here you can do alot more than alter the diameter and hardness, you can alter the shape of the brush with roundness and angle, the spacing, pen pressure, jitter, scattering, noise, wet edges, texture etc, basically you can design your own brushes. Heres a few examples of the kind of brushes you can create and some of the brushes preinstalled with photoshop and the kind of effect they give when drawing with them. 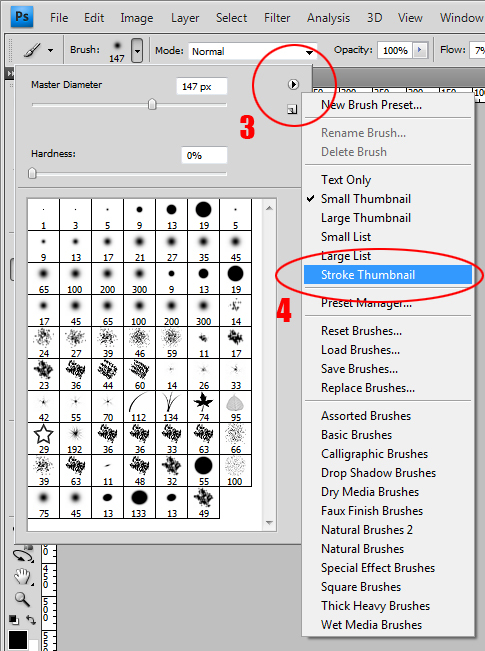 When your done designing your brush you can then save it as a preset by clicking again on the downward arrow (top left) (1) and then clicking the page icon below the rightarrow (2) which brings up a box asking you to name your new brush (3). Put in a name and then as if my magic it gets added to the list of different brush shapes in the palette which you can easily access. 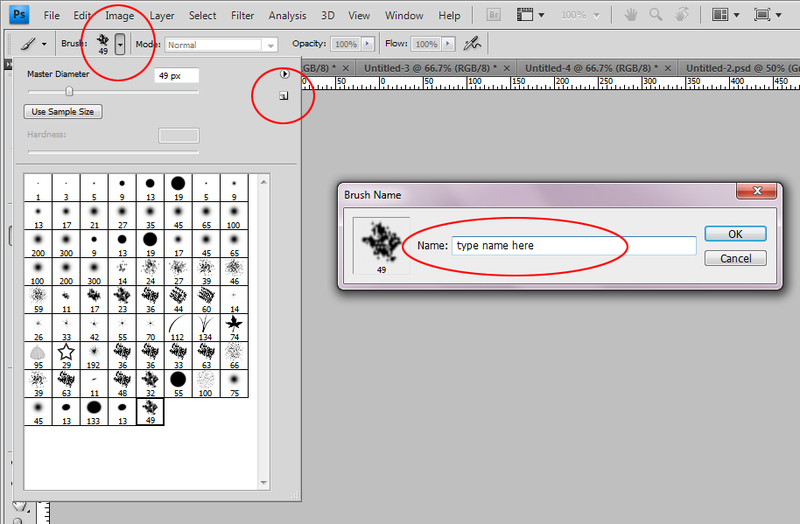 My advice when you design you own brush shapes is just keep playing about with all the different shape modifications because many of mine i came up with by accident, this one for example which i use alot is great for creating a watercolour effect when colouring in and it just came about when i was messing with a couple of sliders in dynamics and texture. One of the best modifications is to combine 2 brushes into one with ‘Dual Brush’ and also the texture modification can create some wierd and wonderful brush shapes. Have fun!